Those are real bis-cotti, which in Italian means cooked twice. 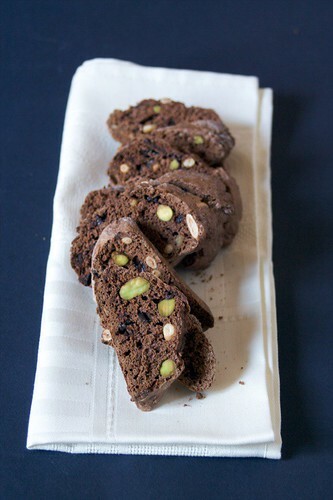 The inspiration comes from Cantucci, the world wide acclaimed Tuscan biscotti, made with almonds. They are part of my hamper for Menu for Hope (read about the whole hamper here). 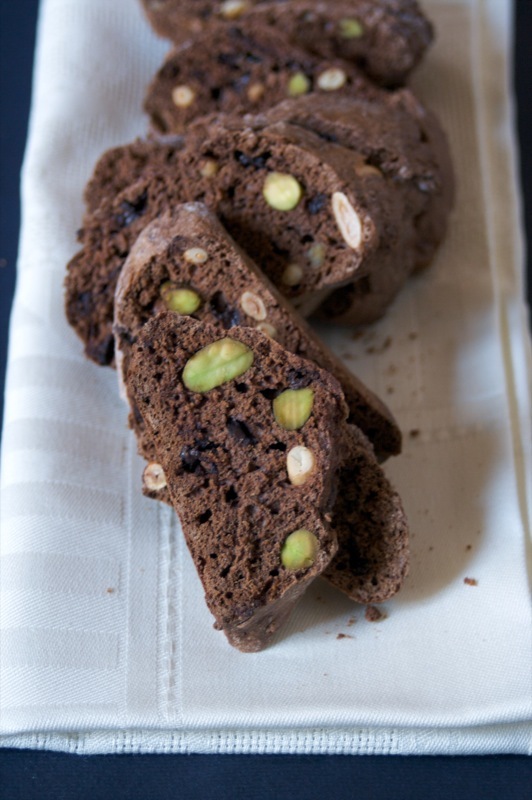 Mix with a mixer, or by hand, all the ingredients, except pistachio and pine nuts. Once the mixture is smooth, but still coarse, add, by hand, pistachio and pine nuts. Dust your hands with flour and form 3-4 sausages 2,5 cm wide and 30 cm long. Take them out of the oven, and let them rest for 5 minutes, or until you can touch them without burning yourself. With a jagged knife, cut each sausage in 5 millimeters thin diagonal slices and arrange them on the baking sheet, well apart. Store in an aright container for up to three weeks. Dark chocolate is my favorite kind of chocolate. Chocolates have some natural antioxidants too.’:.